Plan Ahead: It’s always a good idea to figure out which sessions you want to attend. Do yourself a favor and download the brochure so that you can make note of which sessions you want to go to. Once you get there, you will have plenty of other things that will preoccupy you, so go ahead and figure out which sessions peak your interest before you arrive in Vegas! If you have a smartphone, you should also consider installing the official DevLearn App. Divide And Conquer: With such a large number of great topics being presented, there is a pretty good chance that there will be times when two sessions that interest you will be going on at the same time. Each time I have been to DevLearn, I have been with a team member. We normally try to split up for at least part of the day so that we can attend as many sessions as possible, and then share experiences and notes at the end of the day. If you are a member of the E-learning Guild, it’s okay if you can’t quite attend every session you want, you will be able to download the session materials at a later date from the Backchannel. Have a Back Up Plan: As I mentioned earlier, there will most likely be multiple sessions that interest you going on at the same time. I normally pick at least 2 sessions per time slot, where one is the primary session I want to attend, and the other is my backup. I do this in case the main session I chose isn’t quite what I expected it to be. This way I can leave and head over to the other session that I was interested in attending. Don’t feel bad about getting up and leaving a session to go to another. Most of the presenters understand that you are at the conference to learn, and know that you want to get the most out of your sessions. Just be sure to be respectful in return and leave quietly without causing any interruptions or distracting the presenter. Use Twitter: If you don’t use Twitter, you should definitely consider using it during the conference. It’s a great way to stay updated with the latest conference info, and you can also find groups to meet up with at the conference. You can also use it to follow some of the DevLearn presenters and even your fellow attendees that you meet. Follow DevLearn on Twitter here, and while you are at it, you can follow ME too! Network, Network, Network! : What other chance will you have to spend several days with a few thousand other brilliant minds from the Learning and Development field?! Make sure you take the time to meet new people and make new connections. During lunch, most likely random people will be sitting at your table. Take this time to get to know your fellow attendees. Be sure to bring business cards, or connect on LinkedIn. You may also want to install the Bump app on your phone to make exchanging contact info easier. Many people also form dinner groups at night, so if this interests you, be sure to seek these out. Networking can help you meet a connection that will lead you to a great job, or better yet, can help you make a new friend. Take Advantage of the Information at the Vendor Booths During the Expo: The vendor booths at the expo are a great place to learn about new products and technologies, and you can also get your questions answered. What better way to learn about a new LMS that you have been curious about than by asking a representative from the company face to face? Have a question about how to create a trigger in Articulate Storyline? Just swing by the Articulate booth and ask Tom Kuhlman or David Anderson for some advice. There will be a wealth of knowledge roaming around the Aria convention center, so make sure you leverage it. Watch the Keynote Presentations: The keynote presentations are always an entertaining part of the conference. Last year one of the presenters ate fire on stage, so you never know what to expect! These sessions aren’t always directly related to the world of e-learning, but they are still worth checking out. Attend the Morning Buzz Sessions: This probably isn’t high on your list since these sessions occur early in the morning (and there is plenty to see and do in Vegas to keep you up late! ), but if you have a chance to attend, you should do so. The morning buzz groups tend to be smaller, so the settings are more intimate, which leads to more discussion and participation by the attendees than the normal sessions. It is definitely a great opportunity to have one on one conversations with some of the DevLearn presenters. Attend DemoFest: DemoFest is your chance to see a large number of great e-learning projects and samples all in one place. Be sure to spend some time checking out demos to get ideas for your own projects, and better yet, ask the people who actually developed the projects for tips and tricks. Who knows, you might be showing off one of your projects at DemoFest next year! Have Fun! : Last but not least, my last piece of advice is to HAVE FUN! Enjoy your experience, learn something new, share your knowledge, meet new people and make the most of your time at the conference. 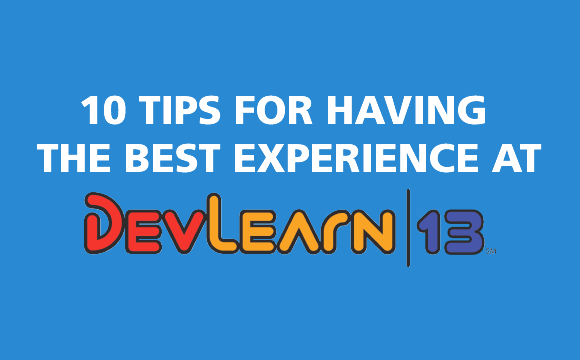 There you have it, 1o tips to help you get the best experience at DevLearn. One final tip before I forget, make sure you wear comfortable shoes, the Aria Hotel and conference center is a big place! Enjoy the conference, and hopefully I’ll see you at DevLearn 14 next year! For more information on DevLearn 13, visit the official site HERE.